10 agosto, never heard anything about it since then. Madrid, stay away. How long is he out for? Anyone know? Omg, omg. Mattia on the field once again. I doubt he'll start tomorrow. Would be risky since he's usually very poor when coming back from an injury - worse than Constant was against Verona. I'd start Constant against PSV. All newspapers & sport TV channels in Italy have him up as a LB tomorrow, and they usually get it right. I love this guy, really can't wait to see him rise another level this term. Would like to see him used more often in Europe. And still only 20 This kid will be a monster! Was up there for man of the match for me. Completely changed our play on the left side, his passing and link up was very good, not to mention his defence. agreed. Unquestionably no.1 LB for me. Best fullback in the world, hands down. Fabulous to have him back. 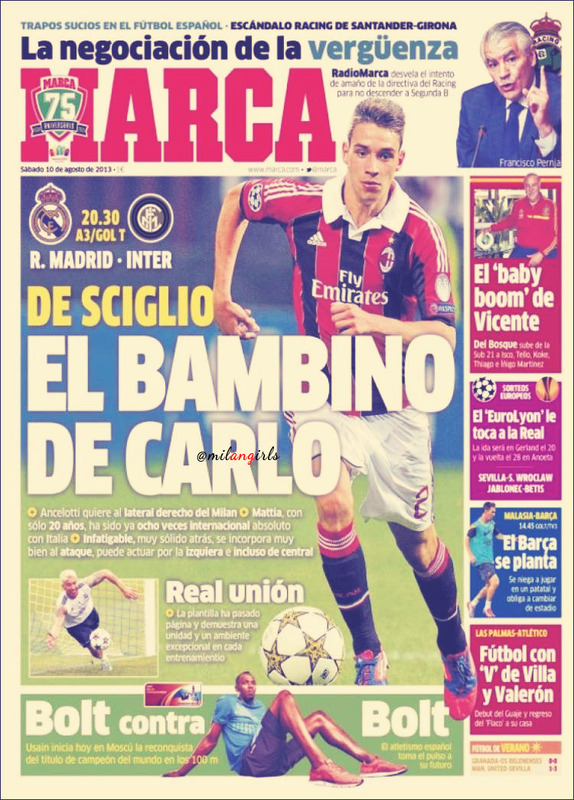 Whether he's De Sciglio or Di Skillio as the commentator kept insisting, he had a marvelous game.